Do you need more positive reviews for your dental website? Reviews can be a great way for other people to learn about your dental practice from other patients. But it can also be a great way to improve your website’s local search engine optimization (SEO). According to Online Media Masters, customer reviews account for 8.9 percent of Google’s local search ranking factors. These local search engine results can help a prospective patient find your business or not. Read on to learn how to get more positive reviews from your patients. You can increase the number of positive reviews you receive from clients by asking them to complete a review before they leave your office. When a client is at your office, this is when you have their full attention. They’ve also just had their visit, so the details or positive points of your care are more clear in their memory then they will be later. If you wait to ask for a review (i.e., via an email), you risk competing against other obligations that take away your client’s focus. This can result in having a less detailed review or one that is not completed at all. These reviews are what help The Smile Gallery and other dental practices differentiate themselves on the internet. You can collect more reviews from clients by offering them the opportunity to complete one online or with pen and paper. If your dental practice treats patients with a wide age range, this makes a lot of sense. Some of your older patients may not have a cell phone or use the internet on their device. You can add this review to the internet by transcribing it later. Younger patients or adults may prefer to fill out a review of your practice on their smartphones. To make the review process as easy as possible, you should offer WiFi at your office, so that you ensure clients have a smooth internet connection. By giving clients options on how they can complete their review, you improve the likelihood they will take action. This will help you increase the number of reviews you receive and give a prospective client more information about your business. Positive online reviews are a great way for people to learn about your practice. They can also help you earn a prospective client’s trust. According to Vendasta, 92 percent of consumers now read online reviews before making a purchasing decision. Needless to say, these reviews matter. Are you looking for other ways to improve your company’s web presence? 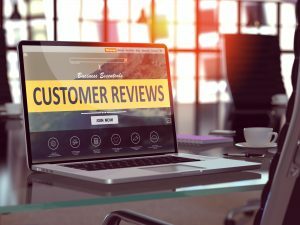 At Reputation Results, we help you manage your online reviews and reputation. We do this by monitoring the reviews of your business on the internet. We also help train you on how to improve your brand and receive the reviews you want on the internet. Contact us today to learn more about how we can help you improve your company’s online footprint.